Skip menu and go directly to content. Skip sidebar and go directly to content. Last spring, the dearest wish of my heart was to own a scythe. 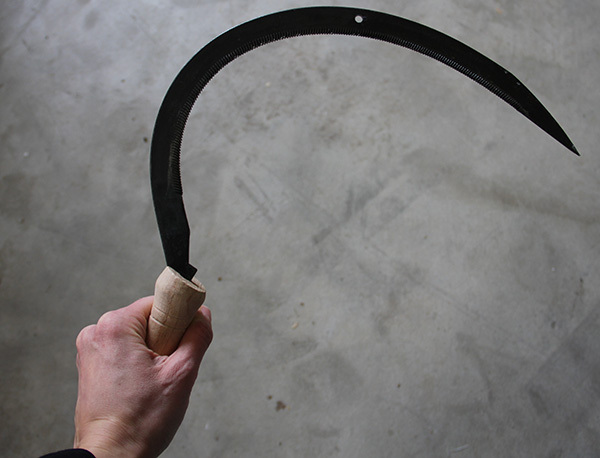 You know, one of those old agricultural tools with a long curved handle, and metal blade. They were used to harvest grain before modern farm machinery took over. 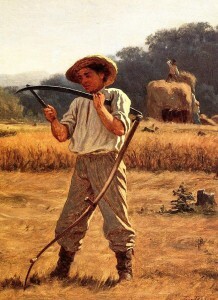 Turns out though, scythes were primarily the domain of men. Something about upper body strength and reach, not to mention the possibility of cutting off a leg. Women stuck to the smaller, crescent-shaped sickle. At least in genre paintings (reference my ongoing obsession with Gleaner subjects). So today, I finally purchased my first sickle. It’s got a wooden handle and a curved metal blade, lined with little teeth on the inside of the crescent. Coincidentally, our yard is badly in need of a mow. So I had to go outside and give it a try. It’s surprisingly efficient. Especially with long grasses. You have to hold onto a clump with one hand, while you hack and saw at it simultaneously with the sickle, so lots of crouching is involved. But it gets the job done. I estimate it will take the better part of a day to mow our yard using the sickle. By then, I should be an expert.